The study involved four major activities to estimate the current market size for healthcare IT integration solutions. Exhaustive secondary research was done to collect information on the market, peer market, and parent market. The next step was to validate these findings, assumptions, and sizing with industry experts across the value chain through primary research. Both top-down and bottom-up approaches were employed to estimate the complete market size. Thereafter market breakdown and data triangulation were used to estimate the market size of segments and subsegments. The healthcare IT solutions market comprises several stakeholders such as Healthcare IT solution providers healthcare IT vendors, healthcare IT service providers, healthcare payers, academic research institutes, government institutes, market research & consulting firms and venture capitalists & investors. Primary sources from the supply side include CEOs, vice presidents, marketing and sales directors, business development managers, and innovation directors of healthcare IT integration solutions companies. Demand-side primary sources include industry experts such as healthcare providers from hospitals and clinics and healthcare payers. The Major players in the market were identified through secondary research and their market revenues determined through primary and secondary research. The market estimations in this report are based on the marketed sales price of healthcare IT integration devices and accessories, excluding any discounts provided by the manufacturer or distributor. After arriving at the market size, the total market was divided into several segments and sub segments. In order to complete the overall market engineering process and arrive at the exact statistics for all segments and sub segments, data triangulation and market breakdown procedures were employed, wherever applicable. The data was triangulated by studying various factors and trends from both, the demand and supply sides. To define, describe, and forecast the global healthcare IT solutions market on the basis of products, applications, and regions. To provide detailed information regarding the major factors influencing the growth of the market (drivers, restraints, opportunities, and industry-specific challenges). To strategically analyze the micromarkets with respect to individual growth trends, future prospects, and contributions to the overall market. To analyze opportunities in the market for stakeholders and provide details of the competitive landscape for market leaders. To forecast the size of the healthcare IT integration market with respect to four main regions, namely, North America, Europe, Asia-Pacific, and the Rest of the World. To strategically profile the key players in the global healthcare IT integration market and comprehensively analyze their core competencies. To track and analyze competitive developments such as joint ventures and alliances, mergers and acquisitions, new product developments, and R&D activities of the leading players in the global healthcare IT solutions market. The global healthcare IT solutions market is valued at USD 2.30 billion in 2016 and is projected to grow at a CAGR of 10.2% during the forecast period of 2016 to 2021. Factors such as rising healthcare costs, strong government support and initiatives to curtail rising healthcare costs, the growing need to integrate healthcare systems, and efforts from healthcare providers to maximize their returns on investment are fueling the growth of this market. The report analyzes the healthcare IT integration market by solutions, application, and region. Based on products, the healthcare IT solutions market is segmented into interface/integration engines, medical device integration software, media integration solutions, and other integration tools. Interface engines are key components in healthcare data integration, thus dominating the healthcare IT integration market with a majority share in 2015. Based on application, the healthcare IT integration market is broadly segmented into hospital integration, clinics integration, lab integration, radiology integration, medical device integration, and other applications. Other integration applications include telehealth services, ambulatory services, and billing and revenue cycle management. 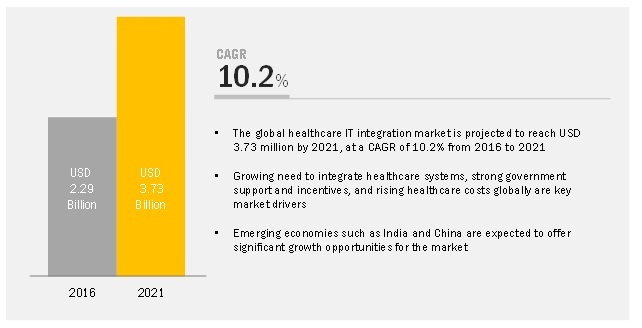 Hospital integration dominated the global healthcare IT internal integration market in 2015. The large share is primarily attributed to the increasing use of IT integration within hospitals in order to maximize value-based reimbursements. Geographically, the market is segmented into North America, Europe, Asia Pacific and Rest of World. North America accounted for the largest share of this market in 2017. The presence of major companies and the growing need to curtail the soaring healthcare costs, enhance the quality of healthcare, improve the overall efficiency of healthcare organizations are the key factors driving the growth of the North American healthcare IT solutions market. The prominent players in the global healthcare IT integration market are InterSystems Corporation (U.S.), Corepoint Health (U.S.), Orion Health (New Zealand), Infor, Inc. (U.S.), iNTERFACEWARE (Canada), Quality Systems Inc. (U.S.), Cerner Corporation (U.S.), IBM (U.S.), Allscripts Healthcare Solutions, Inc. (U.S.), Oracle Corporation (U.S.), Summit Health, Inc. (U.S.), and AVI-SPL (U.S.). In 2016, InterSystems entered into a partnership with Pulse Infoframe (U.S.). Under this partnership, the company’s InterSystems HealthShare platform will be used by Pulse Infoframe for interoperability between clinical research systems and electronic health records (EHRs). In 2015, Merge Healthcare partnered with ICT Health (UAE). The partnership intended to deliver high-quality, affordable integrated clinical technology solutions to hospitals and clinics in the Middle East, North Africa, and India. In 2015, Infor launched CloudSuite Clinical, a new cloud-based interoperability, analytics, and patient engagement platform. The new product was designed to overcome complex interoperability challenges faced by payers, providers, and private exchanges. This helped the company provide better care and risk management solutions in the healthcare IT market. Who are the top 10 players operating in the healthcare IT solutions market? What are the driving factors, restraints, opportunities, and challenges in the healthcare IT integration market? What are the industry trends and current scenario of the healthcare IT solutions market? What are the growth trends in the healthcare IT integration market at segmental and overall market levels? Access Market Size & Growth Rates for Each of the Following HCIT Product/Solutions, at Country Level Using Interactive Product Dashboard.